Wales’ George North runs in his side’s second try during the NatWest 6 Nations match at the Principality Stadium, Cardiff. 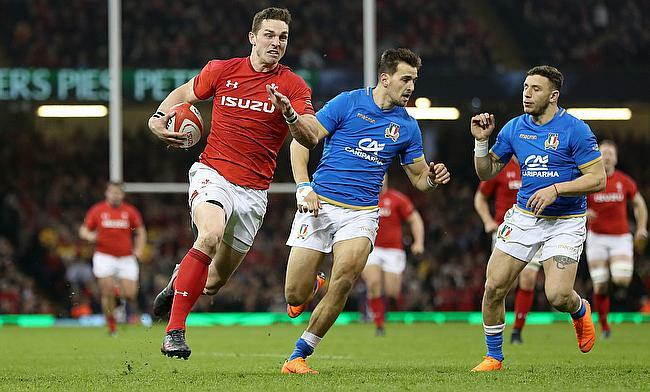 George North scored a brace against Italy as the powerhouse Wales wing helped his side to a 38-14 victory to go 2nd in the Six Nations Championship table. A mixture of new faces and returning veterans combined to give the hosts a convincing victory over Italy on Sunday. A blistering opening that saw three tries scored in the opening 10 minutes left Italy struggling to find a way back into the game. Though Wales ended with only 45% possession and 49% territory, they did much, much more with the ball than Italy. North scored two tries, while Hadleigh Parkes, Cory Hill and Justin Tipuric also went over at the Principality Stadium. Italy failed to put points on the board when they had a man, and briefly two men, more than Wales. Matteo Minozzi and Mattia Bellini got Italy's two tries. Warren Gatland's men have 11 points, leading third-placed England by one as another bonus-point success in next week's tournament finale at home to France would assure the Welsh of the runners-up spot.